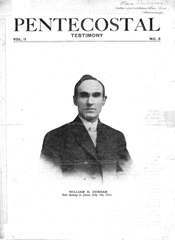 The Pentecostal Testimony, published by William H. Durham, was an important early Pentecostal periodical. Durham was best known for promoting a "finished work" view of sanctification, which rejected the Wesleyan idea that one can instantaneously experience "entire sanctification" (Christian perfection). Durham served as pastor of the influential North Avenue Mission in Chicago from 1901 until 1911, when he moved to Los Angeles. The Pentecostal Testimony, published on an irregular basis, included theological articles by Durham, as well as Pentecostal news from around the world. Durham died in 1912. Some issues of The Pentecostal Testimony have not been located. If you are aware of the location of missing issues of The Pentecostal Testimony, please contact the Flower Pentecostal Heritage Center at archives@ag.org.